Sometimes, you just need to get outside your country's borders to find your purpose. Opportunities also abound for emigrating entrepreneurs. Ever dream of living and working abroad? HSBC’s 2016 Expat Explorer report uncovers surprising information about emigrants and their preferred countries of residence. A total of 26,871 expat respondents shared their views on life abroad with a focus on careers, financial well-being and quality of life. Singapore tops the charts as the most desired destination for emigrants, with more than three in five expats in Singapore saying it’s a great place to progress their careers and increase their earnings. On top of being an amazing area for expats financially, it’s also recognized for its excellent quality of life and safe and family-friendly environment. 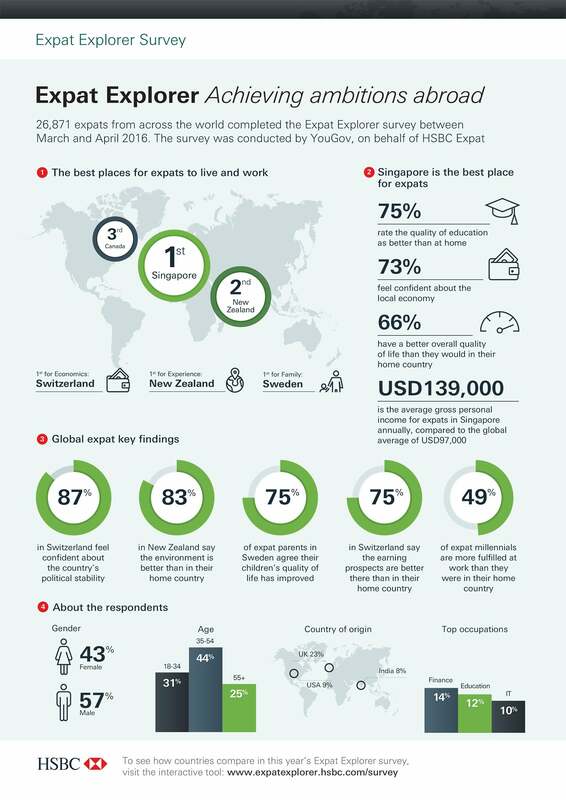 Overall, 66 percent of expats agree that Singapore offers a better quality of life than their home countries and 75 percent say education is better there too. Beyond Singapore, the study further organizes top expat destinations by economics, experience and family. For the second year in a row, Switzerland is ranked number one in economics for its unrivaled financial well-being and strong economy. Eighty percent of survey respondents were confident about the country’s economy and nine in 10 were also confident of its political stability. New Zealand takes the cake for top experience, taking into account environment, culture and political equality (i.e. religion, race, gender, sexual orientation). Overall, almost three-fourths of expats living in New Zealand say the quality of life is better than their country of origin. Lastly, Sweden ranks number one in terms of offering a family-friendly environment for expats. In fact, three quarters say it’s better for their children compared to their home countries. The report also reveals a surprising number of millennials (22 percent) move abroad to find more purpose in their careers. Only 14 percent of people aged 34 to 54 and 7 percent of people older than 55 make the big move. In the end, more than half of these expat millennials say that they feel a greater purpose in their work compared to what they were doing in their home countries. Like millennials, entrepreneurs are more likely to move abroad too -- 44 percent say they they have elected to set up or grow their businesses outside their home countries because they seek a new life and stronger career. Unlike the typical expat, emigrant entrepreneurs often establish themselves in countries with emerging economies such as Peru, Brazil and Chile, whereas expats play it safe in countries with developed economies. Meanwhile, China's Pearl River Delta has seen a flurry of entrepreneurial activity from both Chinese and foreign-born entrepreneurs. Check out the infographic below to see more statistics on expat.